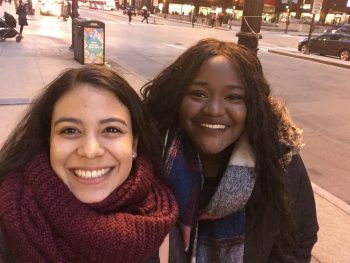 My name is Bernadette Arthur, and I am a spring 2017 Chicago Semester student. Transitioning from a smaller city like Grand Rapids (where my college Calvin College is) to a larger city like Chicago has been a refreshing experience for me. I grew up in the city of Accra, Ghana, West Africa, and so I was very excited to move into a bigger city. There are plenty of diverse populations, and diversity in the quotidian things like train rides and grocery shopping. It is refreshing to be in a city full of endless explorations and beckoning adventures! For example, since being here, I have been to the famous Field Museum, Chicago Art Institute, Museum of Contemporary Art and TimeLine Theater, which performs various timepieces. For an avid performance lover like me, I definitely enjoy this aspect of being in Chicago! I do not live in the Chicago Semester housing, so my commute is a little longer compared to my other classmates. However, I enjoy the accessibility of trains and buses throughout the city. I have come to enjoy my commutes to and from work or from class, because there are never the same kind of people on a train ride, so the experience is always different. Train and bus rides so far have been very safe; I have not felt threatened riding in them. In fact, as I mentioned earlier, I love the time that I get to sit on the train and read a book, listen to some music, or just people-watch. Chicago is a city that bursts with exciting cuisines. One memorable feast I had was with some Chinese friends who live in Chicago. For Chinese New Year, we went to Triple Crown Restaurant, which has Szechuan style food. It was great to enjoy an important mark of the Chinese calendar with them. I haven’t been very adventurous with food yet, but I aim to get some of the most popular restaurants and foods tried and tested soon! I am currently interning at Heartland Alliance, which is a refugee agency. I specifically work for the Resettlement and Placement, which deals with the first three months of a refugee’s life in the United States. At our agency, we call refugees “participants” because we believe that our participants chose to be a part of our resettlement program and choose to partake of the resources available to them. This is to highlight our participants as self-determined. Some of my responsibilities include taking participants to apply for Social Security cards, assisting with apartment set up for participants, writing case notes for participants, and generally interacting with participants to see to their immediate needs for their first three months in the country. It is a great honor to work with refugees in this present day because refugees are a very important population group in our modern day. As such, I am always grateful for the opportunity to be working with such a sensitive demographic. It is always rewarding at the end of the day to know that my colleagues and I have helped improve the quality of life of our participants. In the good days and in the bad days, I always feel fulfilled after work each day. I am glad that I get to feel that every day, despite the good and bad, and I am grateful that Chicago Semester helped pair me with this learning experience.